In reality, this sunset was more peach & gray than pink, but pink seemed more fitting for Valentine's Day/love week. Psalm 40:16 is one of the first verses I ever memorized shortly after accepting Christ. The Lord used it to speak to my heart one evening almost 37 years ago as I was reading through Psalms. I prayed then, as I do now, that I wouldn't stop seeking the Lord or rejoicing in Him, that I would joy in my salvation, and would continue to praise the Lord. We're praising the Lord especially this week, as it looks like He's answering a prayer that we've had for more than a year. It's so wonderful to see God work! Thanks, Michele. Happy week to you! Sp appreciated this photo and Scripture! Have a blessed Sunday! Amen, Joanne. Have a blessed week! I'm rejoicing with you about answered prayer! Thanks, Elizabeth. Isn't it wonderful to know that the Lord hears us? Rejoicing with you regarding answered prayer. Beautiful photo with a beautiful sentiment. I appreciate your comment, Karen. God is good! It is a beautiful verse...certainly full of love and hope. Yes, this verse is full of love. Great observation! Oh Julie! Praises for answered prayers! Amen, Jamie. It's wonderful to see the Lord at work! This is gorgeous-- your picture and your testimony. 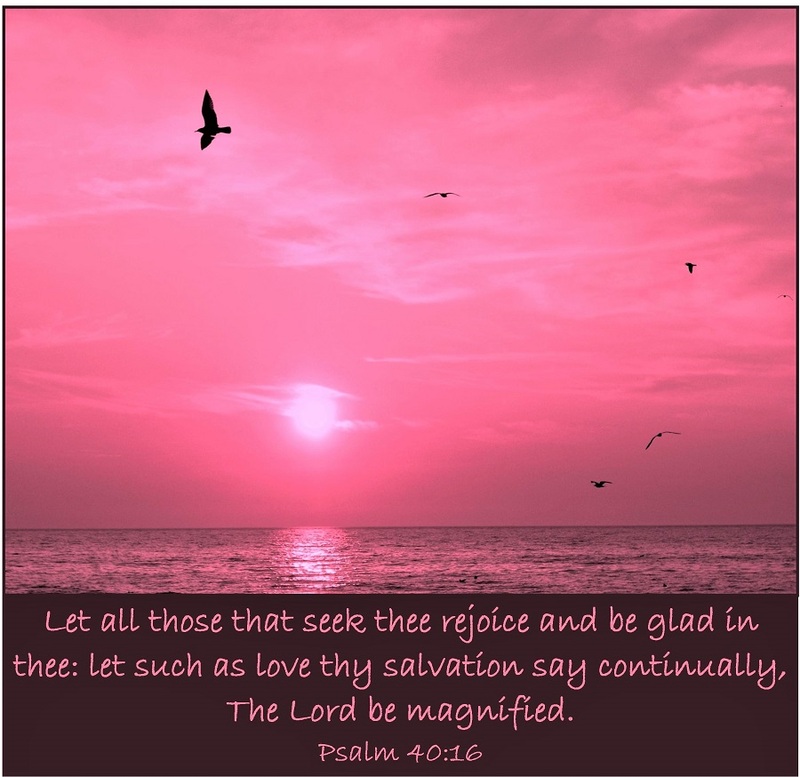 The Lord be magnified! Praise the Lord for answered prayer!! I agree, Praise our Wonderful Lord!